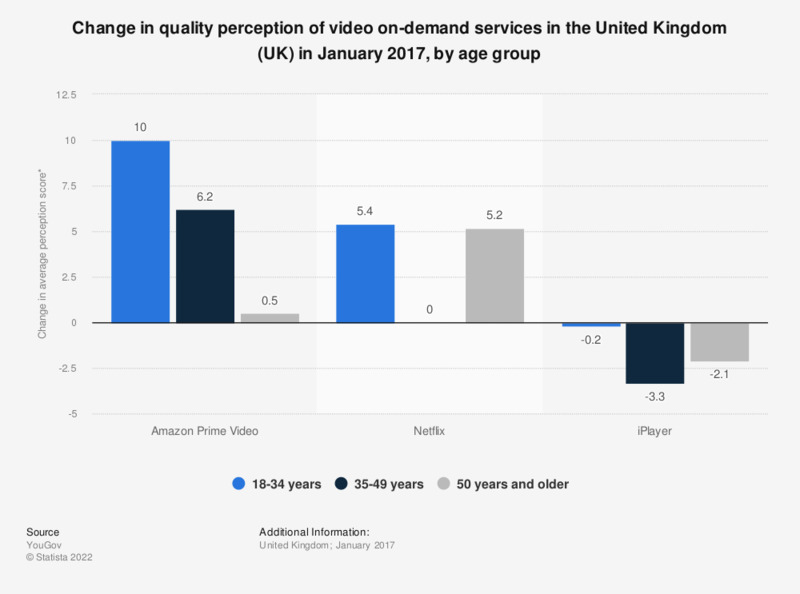 This statistic shows the change in quality perception of video on-demand services compared to the previous year in the United Kingdom (UK) in 2016, broken down by age group. Compared to 2015, Amazon Video Prime gained in perception of quality, satisfaction and value among 18- to 34-year-olds, with an increase of 10 points. * Refers to average score for 2016 minus average score for 2015. YouGov BrandIndex awards brands Buzz scores based on a survey of respondents that asks: "If you've heard anything about the brand in the last two weeks, through advertising, news or word of mouth, was it positive or negative?"